Here at Land Design we work with both residential and commercial clients; many landscape contractors don’t realize that we also offer design services that they can utilize when they need to. Many landscape contractors are extremely busy and don’t have a lot of time to spend on designing. Many smaller companies would like to have a designer on call when they need one. 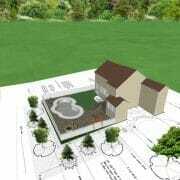 We offer a range of services from simple flagging to 3D visualizations for hardscape projects. Take a look at what we can do for your business; refer clients directly to us or subcontract us for the design phase.